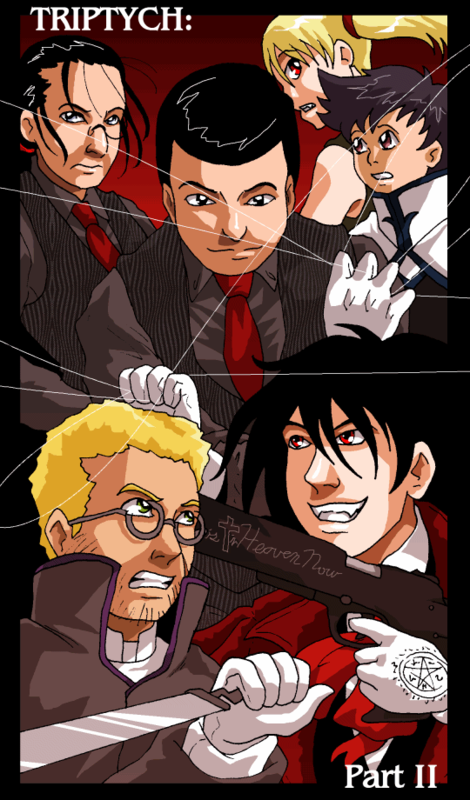 The second of the battles: Anderson, Alucard, Walter, and Jeeves, with Maggie and Marian not far behind. Meanwhile, back at the big-name battle… Anderson: I will stab you with my bayonets! Alucard: Not before I shoot you with my big guns! Marian: I’m glad this isn’t our fight. It’s way too phallic for me! iJeeves: If I might be permitted to interject an opinion? Mister Anderson, perhaps you have observed the behavior of a cat when it feels no pressing need to devour its prey. I believe the metaphor has particular relevance to your present situation. And Mister Alucard… Let us be frank with each other. You deserve better. Alucard: I doubt you’ll hold a candle to the real Jeeves, but I can’t wait to see what powers you have. This should be an interesting fight indeed! iJeeves: Sir, I am afraid you have misunderstood me. I will not be your opponent. That honor falls to this man over here. Walter: You’re nothing more than a cheap knockoff. It would be an insult to Jeeves’ memory to let you live a moment longer. [SWOOSH] iJeeves: Too slow. [SLAM] Walter: Aagh! [Perfect 10] Walter: nnngh… A lucky hit. Don’t let it make you cocky, young man. iJeeves: Indeed. Dear Walter. I had hoped you would be more cooperative. But I see it was not to be.